10+ years of team experience in design, manufacturing, and installation of helical screw piles throughout Alberta and Western Canada. Creative engineered design solutions for all your project needs. In our CWB-certified shop, we fabricate quality products that meet your budget. Safe, accurate, efficient installations that meet your schedule. 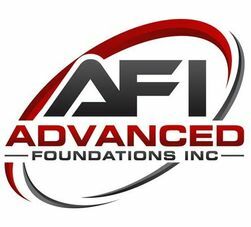 Advanced Foundations Inc is a screw pile contractor operating in Edmonton and throughout Alberta, offering design and installation services on screw piles for residential, commercial, and industrial sectors. We offer a full range of services all under the same roof. Whether you need engineering, manufacturing, installation, or all three, we are the professionals to come to. With over 10 years of experience behind us, our expertise cannot be beaten. We specialize in helical piles, also called screw piles. Helical piles are fast-growing in popularity for their ease of install and their versatility. Give us a call today to request more information. Our experienced estimators produce quotes based on preliminary design and project information and our engineers provide free preliminary consultations to our valued customers. We have experienced structural and geotechnical engineers on staff. We are capable of providing foundation design solutions for projects of any size, whether you’re in the oil industry, the commercial sector, or residential construction. In our CWB-certified shop, we fabricate the products as per the project specification and client’s requirements. Our experienced welders deliver high product volumes with high standards. No matter what the conditions are, we can provide fast and efficient installation services. Our installers have years of experience to help you with your project. We have a highly-trained project professionals assigned to each project. They’ll provide help with planning, communication, and executing the project, providing you with regular status updates.